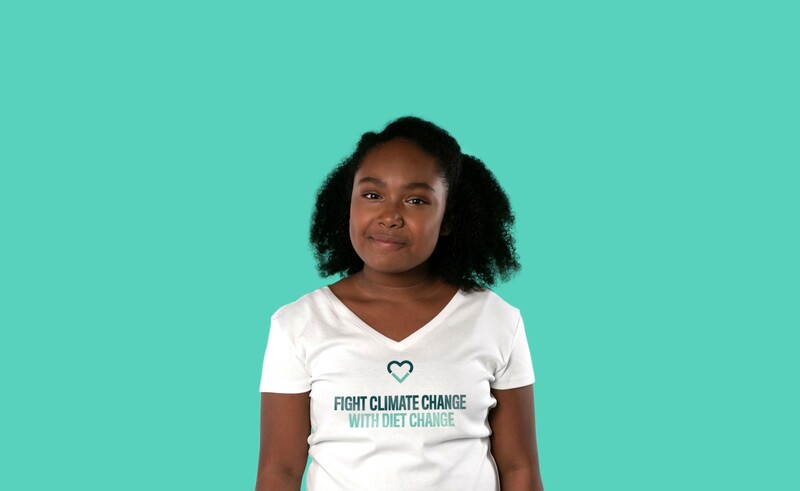 As we begin the first day of Lent, 12-year-old climate change campaigner Genesis Butler has received a response from Pope Francis regarding her plea for him to try vegan for Lent as part of the Million Dollar Vegan campaign. However, Pope Francis has not confirmed whether he will do so, and therefore the campaign is now asking whether His Holiness can meet with Butler over a vegan meal at the Vatican, during the Lenten period, to discuss her concerns. Should Pope Francis accept, Million Dollar Vegan will gladly donate $1 million to a charity (or charities) of His Holiness’ choice. If the Pope prefers to meet Genesis over a vegan meal, without the $1 million donation to charity, that will also be gratefully received. The response from Pope Francis, signed by senior priest and Assessor for General Affairs Paolo Borgia, reads: “His Holiness Pope Francis has received your letter, and he has asked me to thank you. He appreciates the concerns about care for the world, our common home, which prompted you to write to him. A copy of the letter, as well as a photo of Butler holding it, can be found here. 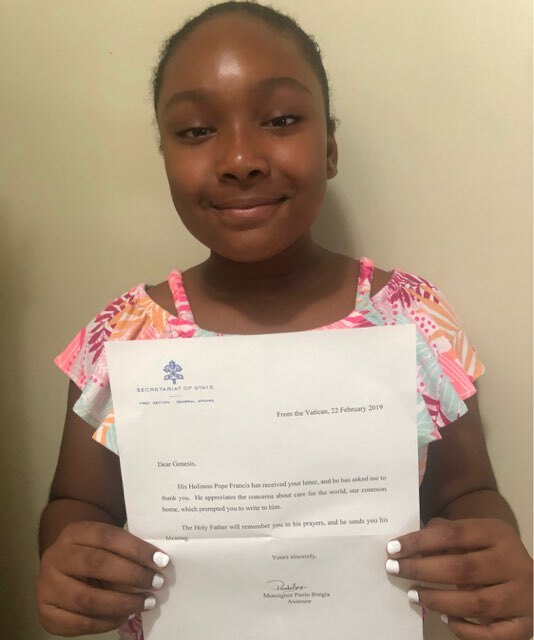 Butler has recorded a new video message for Pope Francis, and is responding directly to his letter with: “Your Holiness, I am truly humbled with gratitude by your acknowledgment of my request to observe a vegan Lent. Thank you so very much for blessing me and keeping me in your thoughts and prayers. It means more to me than I can ever express in words. People of all faiths are being encouraged to join Orthodox Christians in trying a plant-based diet for the Lenten season. A Vegan Starter Kit is available to download from the Million Dollar Vegan website, packed with helpful information about switching to a vegan diet. The Million Dollar Vegan campaign also launched a change.org petition calling on Pope Francis to fight climate change with diet change, which has been signed by almost 85,000 people. California State Assembly Member Ash Kalra (D-San Jose), accompanied by cosponsors Social Compassion in Legislation, People for the Ethical Treatment of Animals (PETA), and the Physicians Committee for Responsible Medicine, announced the introduction of AB 1586, the Replacing Animals in Science Education (RAISE) Act. 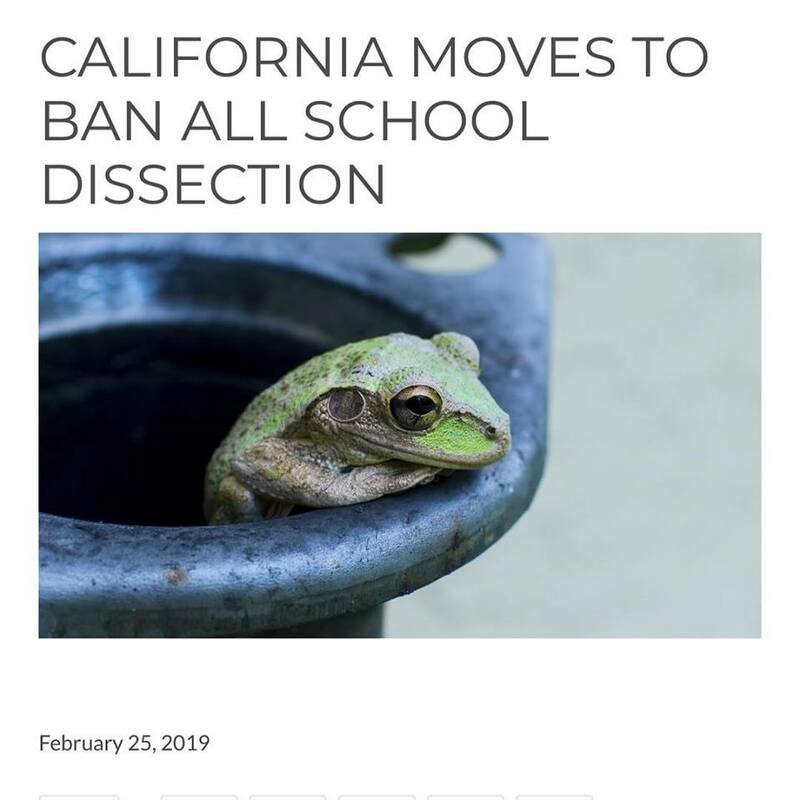 Under the proposed legislation, all California schools would replace animal dissection activities with contemporary and humane teaching methods in line with industry standards and best practices. Dissecting animals is costly, exposes students and educators to carcinogenic chemicals, hurts animals and the environment. Advances in medical-simulation technology, educators’ need for better teaching and assessment tools, and growing concern about animal use in laboratory experiments have all contributed to a paradigm shift in biomedical education. Today, simulation-based learning is more widely available. The popular understanding of dissection in schools is the dissection of frogs and worms. However, a recent survey of schools that require dissection as a part of their science curricula include fetal pigs, cats, sharks, sheep and other animals. The use of these animals can number in the hundreds per academic school year. When accounted for in totality it provides a clearer picture of both the fiscal impact to schools and the impact that the sourcing of these animals can have on the environment and fragile ecosystems. Top academic programs including the International Baccalaureate, the Next Generation Science Standards (which California adopted in 2013), and The College Board’s Advanced Placement program do not require—or even mention—animal dissection in their curricula. AB 1586 is also supported by the National Hispanic Medical Association, Humane Education Coalition, Center for Healthcare Education, Inc., and the United Federation of Teachers -Humane Education Committee.